From Waitress, at the Brooks Atkinson. A lot of the preview press for the new Broadway musical Waitress, which opened tonight at the Brooks Atkinson, concerned its groundbreakingly all-female creative team: Sara Bareilles (songs), Jessie Nelson (book), Lorin Latarro (choreography), and Diane Paulus (direction). Even if this seemed to ignore the three men among the show’s four topline designers — not to mention earlier breakthrough work by the likes of Elizabeth Swados — it struck me as an impressive marker for the improving state of gender equity in the theater. But I didn’t expect it to signify anything further. Feminism does not suggest or hope that women can tell women’s stories better than men can, or for that matter that there is such a thing as a women’s story. Only that everyone should get a piece of the pie. And yet Waitress is clearly, passionately, and for the most part delightfully a feminist musical. Not because its plot passes the Bechdel Test; it doesn’t. The stories of each of the three servers at Joe’s Pie Diner in fact hinge on their romantic entanglements with men. Jenna, the quiet one, is a gifted baker trapped in a loveless, semiviolent marriage. Becky, the feisty one, is on the prowl for distraction from her aged, bedridden husband. And Dawn, the ditz, is trying to perfect an online-dating profile that will attract a man as interested as she is in rare turtles and Revolutionary War reenactment. Despite the need to feed all of these plots with plenty of incident and song, what the show most successfully dramatizes is the way the women support one another in between. Early on, when Jenna suspects that a drunken night with her husband is the source of her morning nausea, Becky and Dawn force her into the diner’s bathroom to take a pregnancy test. “The Negative” is probably the first “pee on a stick” song in the history of musical theater. Later, when Jenna has her first contraction — the test turned out positive — the show’s focus expands beautifully, as various women in the ensemble appear in the background, experiencing and vocalizing the same fear and astonishment. But the creative team’s success at portraying the communality of women’s experience comes at a price. Elements that were quirky and captivating in the source material — Adrienne Shelly’s 2007 movie, starring Keri Russell — turn outlandish and a little icky when musical-comedy-ized. Songs, by their nature unnaturalistic, will do that. Jenna’s affair with her adorable obstetrician, a plot turn that seems quietly inevitable when depicted on film, acquires a glaze of random kookiness when turned into ballads and charm numbers onstage, and clashes disturbingly with the threat of domestic violence. Likewise the theme of Jenna’s baking, formerly a leitmotif, now becomes a heavy one, kneaded ad nauseam from the show’s first words (“Sugar, butter, flour”) to its final images. It may not help that the proscenium is lined with gigantic rotating display cases of pies, and that small glass jars of key lime, apple, and Oreo are sold (for $10 each) at intermission. The current Broadway rule book apparently includes a chapter on brand discipline. Still, Bareilles, a pop star whose hits are strongly rooted in the storytelling-blues tradition, manages better than almost any recent crossover songwriter to find clever, charming hooks that tie her character- and scene-defining numbers to story particulars. The opener, “What’s Inside,” suggests the overarching pie imagery but also the musical’s theme of self-discovery. 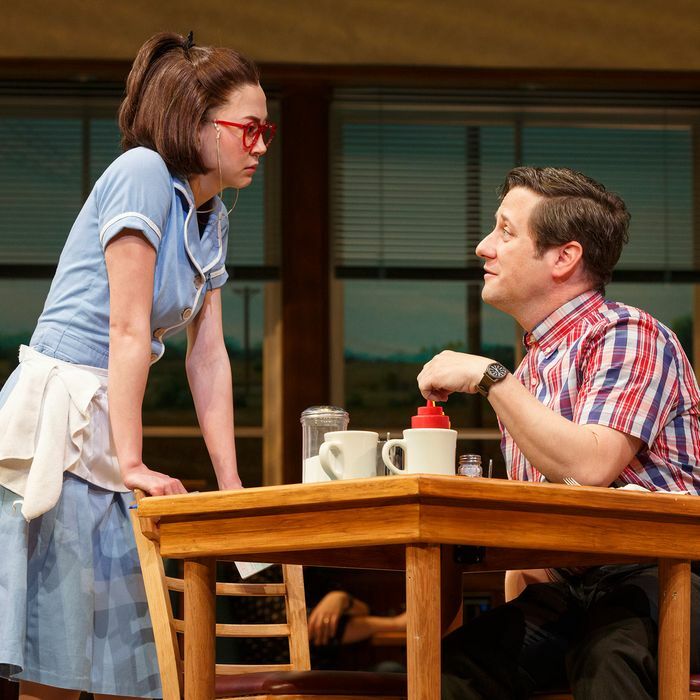 The charm song, introducing the unlikely romance of Jenna and Dr. Pomatter, makes a natural connection between infatuation and mouth-feel: “It Only Takes a Taste.” Even the specialty numbers, typically wan in shows written by Broadway neophytes, work well here. “Never Ever Getting Rid of Me,” a song for the odd little man who answers Dawn’s ad, is a showstopper for quirky Christopher Fitzgerald. Oddly, it’s only in the ballads that Bareilles’s pop background betrays her; the melodies are lovely but the construction wobbles and the lyrics revert to vague. (“Come out of hiding, I’m right here beside you / And I’ll stay there as long as you let me.”) It is the great fortune of Waitress, though, that most of these songs are sung by Jessie Mueller as Jenna, confirming her status as a Broadway star of the first order. She’s a vocal chameleon, sounding almost as much like Bareilles here as she sounded like Carole King in Beautiful, but it’s her intelligence and her way of specifying sadness in the crannies of her voice that make the sometimes generic material riveting. And not just in the songs. Her concept of Jenna as a woman trapped less by her marriage than by her own fatalism — as if women had no choice but to be forever faithful to their mistakes — is a moving wonder throughout. The production both supports and fights this idea. The support comes largely from Keala Settle as Becky, giving an unsentimental performance just at the border between musical comedy and something much harsher. (The huge-voiced Settle is not afraid of throwing some stink eye.) Also underlining the complexity and size of the issues are the bold vocal arrangements by Nadia DiGiallonardo. On the other side of the genre split, Drew Gehling brings screwball charm and good hair to the could-be-disastrous role of Dr. Pomatter. But however much these performances bridge or straddle the gap, there’s still something subtly awkward about the distance between the material and its Broadway incarnation. That Jenna, who at first does not want a baby, might choose an abortion is only half-mentioned — the actual wording in the script is “abor … ” — as if audience pre-testing (Waitress tried out at the American Repertory Theater in Cambridge, Massachusetts) had identified a sore spot. The ending, wanting to avoid a statement that could be construed as either anti-romance or anti-independence, finds the three women with precisely 1.5 men among them. In her staging, Paulus also splits the difference. The overbusy mise en scène of previous projects such as Pippin and Finding Neverland, which often seemed motivated by a desperate need for distraction, is applied to about half of the material here. But the other half, particularly in Mueller’s scenes and songs, is more subtly shaped and stronger for it, as if Paulus finally had something to trust. Waitress can still be an uncomfortable genre mix: domestic-violence drama and workplace rom-com. That’s in the source material, and the musicalization exaggerates it. What I certainly didn’t expect, though, is that the musicalization could also help to justify the mismatch. As the story rushed toward its multiple conclusions — a typical Broadway problem the creative team was unable to solve — I began to understand that for these characters, life itself is an uncomfortable genre mix. Seeing that and sharing it is the start of their mastering it. Perhaps it really did take an all-female creative team to understand how such a story could be true, and how it could sing. If so, well, hand me a slice of that humble pie. Waitress is at the Brooks Atkinson Theatre.